Eleanor of Toledo, or Eleonora di Toledo, was born in 1522 and died on 17 December 1562, aged just 40. She was the Duchess of Florence and became the wife of Cosimo I de’ Medici (who fathered the illegitimate Bia). In this rather sad looking portrait by an unknown artist, Eleanor wears a long string of pearls wrapped twice around her neck. Often, ladies would tuck the excess necklace down the front of their dress, perhaps to stop it flopping in their dinner! I’ve made a number of 4 ft long chains in a variety of colours and styles. Any size pearl, in any colour and any style of chain can be made quite easily. A simple chain in black and gold. Another simple chain in ivory and gold. I added small metal beads either side of the pearsl in this one, inspired by a Roman necklace I saw in the British Museum. It was interesting to note that the Romans used exactly the same construction method that I use! 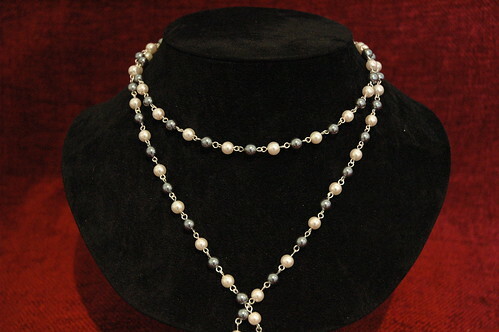 This chain features larger pearls, with three rings linking each one.